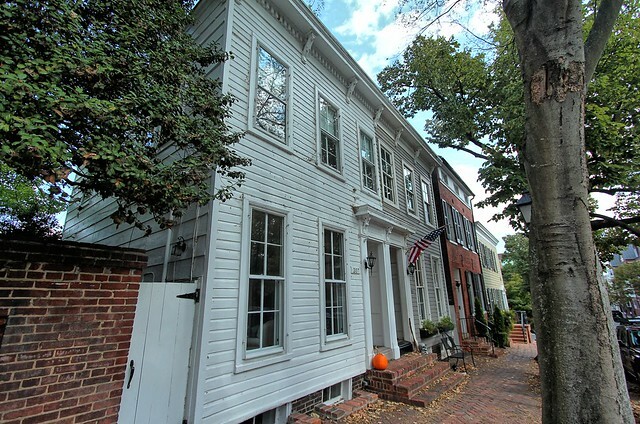 While Alexandria's Southeast Quadrant may be a major historic attraction when it comes to old homes, many of Old Town's oldest and most well known homes reside just across King Street in the Northeast Quadrant of town. 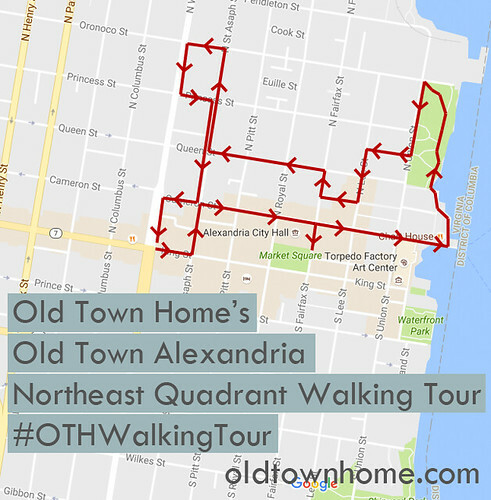 As we continue our Old Town walking tour series we'll focus on this important northeast section of Alexandria where the city's original center was situated, and where Alexandria's most famous families, the Washingtons, Lees, and Carlyles, all ate, slept, and lived. This walking tour is 2.2 miles and should take between an hour and one hour 20 minutes to complete (more if you opt for a tour at any of the museum stops). The terrain is easy and there are no hills or tricky footing. 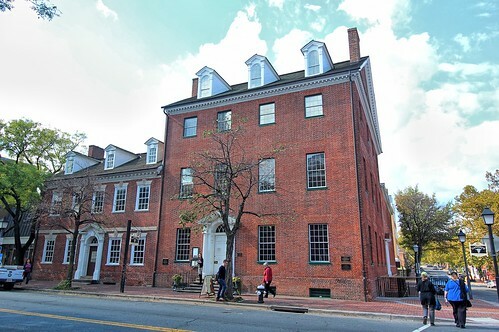 We'll once again start this tour at the central intersection of Alexandria's four quadrants, Washington and King Streets, directly in front of the Alfriend Building, also known as the John Gordon house, on the northeast corner of the street. This beautiful building is a row end building with a Georgian facade, one of the few remaining in Alexandria. This building is one of so many that could so easily be lost among the crowd of historic buildings. 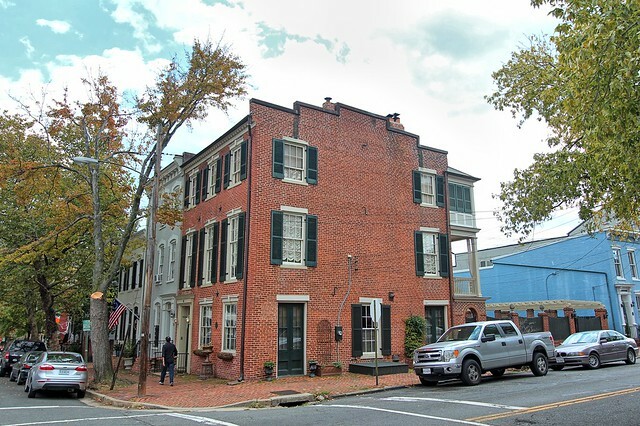 But upon closer look, it's the only remaining historic building on the four corners of this main intersection of King Street, having been originally constructed in 1799 (though the plaque states 1796). 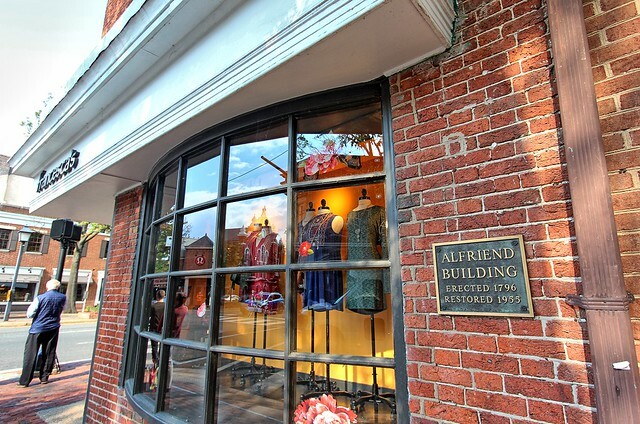 Today it houses a women's clothing and accessory shop, but in its past life it was corner to everything from a private home to an auto parts store. Walking east on King Street towards the river you'll approach and turn left onto North St. Asaph Street. Along this corridor of shopping and dining take a moment to notice the various stores and businesses that line North St. Asaph. It's a testament to how this area of Old Town has remained a commercial section of town throughout Alexandria's history. When you reach Cameron Street, just a block off of King, turn right and begin heading east again. (Don't worry, we'll be back here later to see the houses the other direction, so you aren't missing anything.) As you turn right onto Cameron look across the street at a collection of unique 18th and early 19th century houses. This is just a taste of what makes Cameron one of our favorite streets in town. Make sure you pay attention to the various markers and plaques on buildings along this walk. This portion of town has the most varied markers. If you want to learn more about what you're seeing, check out our blog post all about markers in Old Town. We won't be pointing out specific markers, but you will surely notice them all over this walking tour. You may have caught on already, but the streets of Old Town, much like many street layouts in towns established while under British rule, are named for the various levels of the monarchy. Centered around King Street, you'll see Prince, Queen, Duke and Princess, but why Cameron as the first street off of King? Interestingly enough, Cameron Street was named after Thomas, Sixth Lord Fairfax, Baron Cameron, who just happened to be the wealthiest person in the county. It would seem that not only was a major street in Alexandria named with intent to flatter an influential individual, but it just happens to be the street that was originally supposed to be the main street in the town. 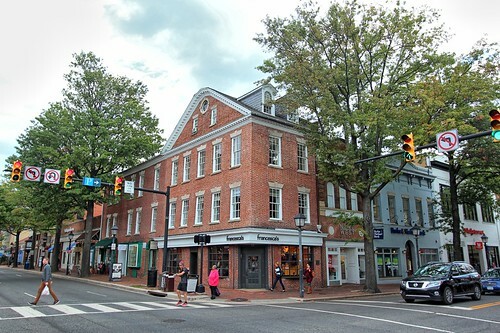 King street wasn't originally the central street in the geographic town, but instead Cameron and Fairfax Street was to be the town's original hub. Keep this in mind as we continue on our walk. Just a few houses down on the right hand side of the street keep your eyes peeled for a small clapboard and cedar shake roof house with elevated entry stair and two dormers with fish scale siding. This house is George Washington's townhome...sorta. 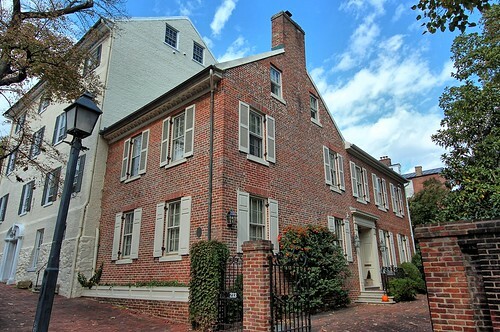 Actually, this house is a 1960 replica version of what is believed to be roughly what George Washington's townhome that once stood on this site looked like when it was constructed in 1769 and unfortunately torn down in 1855. 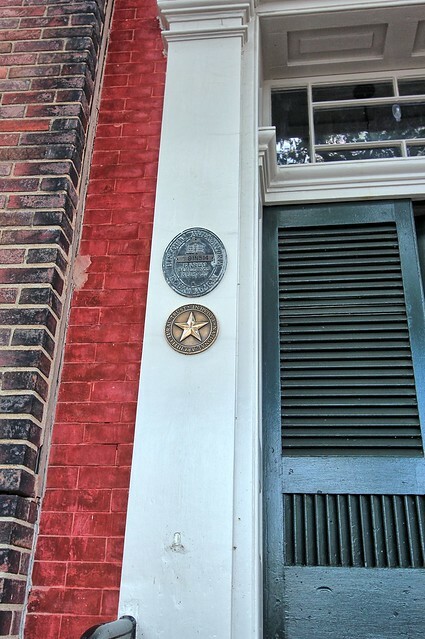 In the previous blog post about historic markers I mentioned how Alexandria's history is so extensively centered around George Washington that you almost can't throw a stone without hitting a plaque that mentions him, and this home is no exception. 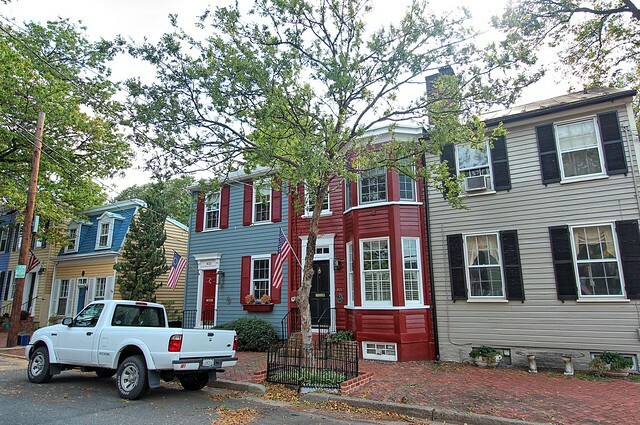 Take a moment to picture what this block looked like when Washington built this small townhome on the very edge of Alexandria. The townhome, along with a stable, kitchen, and other necessary buildings, were pretty much all that existed on the block. 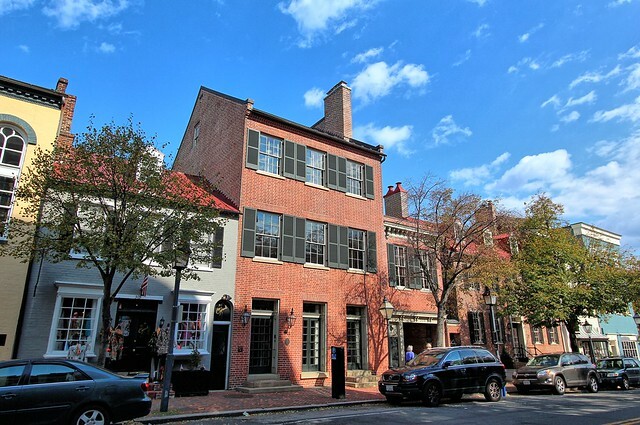 Washington owned 1/2 of the block and likely preferred the location due to the close proximity to his family church, Christ Church, just up the street. He would occasionally stay in this house when a trek back to Mt. Vernon (8 miles away) was too difficult. 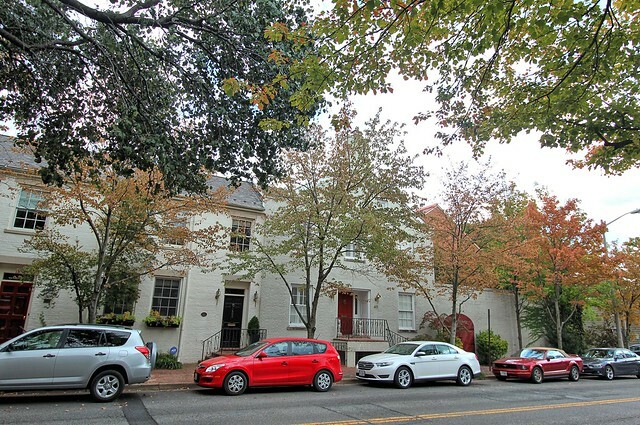 Washington also offered this home to people making the journey down to Mt. Vernon who had arrive in town too late to make the additional 8 mile trip from Alexandria in the same day. Continue east on Cameron Street and as you pass Pitt Street you'll feel like you've stepped from the early 19th century right into the 1970s. After the previous buildings in this first half of the block were razed in the 1960s, the large office on the right was built in 1968 and the garage townhouses on the left were built during Old Town's urban revival in 1977. I feel like this half block is a little bittersweet as Old Town lost a good deal of beautiful historic buildings, but at the same time it represents the steps taken to turn Old Town's fortunes around, replacing dilapidated and abandoned buildings with a focus on the future of this town we now love. Just a half block after you're faced with all of the "new," you're immediately back amongst the old and historic. 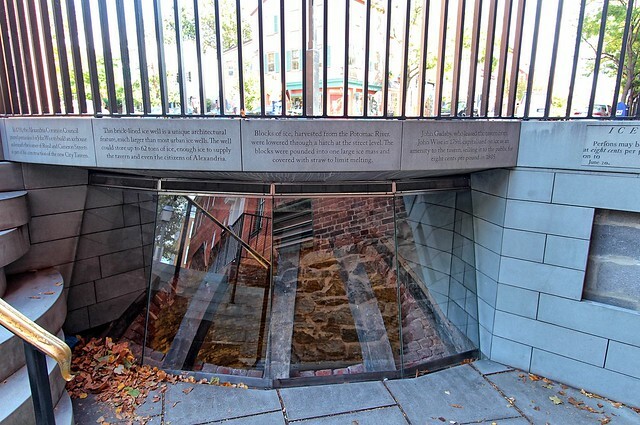 On the right side of the street keep your eyes to the ground and you'll happen upon the historic ice well. This nicely preserved and recently restored ice well is an example of 18th century luxury. It was built in 1793 and supplied ice to Gadsby's Tavern, which is connected to the ice well by an underground tunnel. The ice well is one of those historic treasures that Old Town has retained over the years and we're truly fortunate to have an opportunity to look back through time due to the dedicated efforts of those that have worked tirelessly to restore and preserve our charming town. 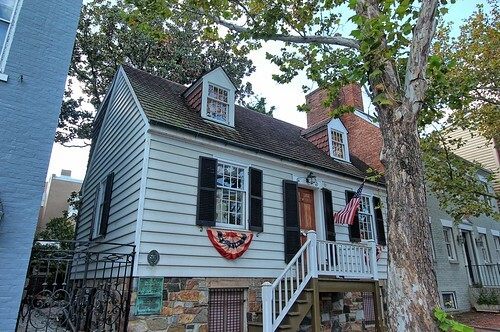 Speaking of George Washington...Gadsby's Tavern is another one of Alexandria's infamous "Washington Slept Here" locations. The beautiful building on the corner of Cameron and Royal Street is one of the most historically significant in the area. The museum and restaurant has been a fixture in Old Town for over 200 years, and each year hosts various tours and events to help you get in touch with Alexandria's history through period dress reenactments. And of course...Washington ate and slept there. If you're looking for a museum tour on your walk, this is certainly a good option for a stop. As you cross Royal Street you will reach what was the original edge of town when Alexandria was established in 1749. Pause for a second and take a look back over your left shoulder at the building on the corner of Royal and the first few houses on the block. 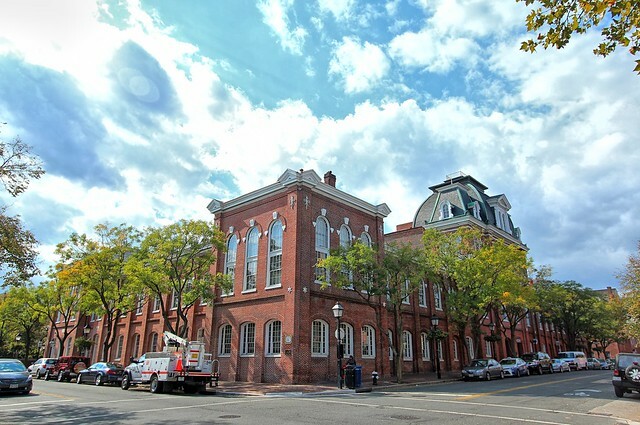 The large unpainted brick building just recently underwent an extensive multi year renovation that has helped revive the once tired building. Period appropriate materials and methods were used when restoring the exterior, which is so important when dealing with a structure in this part of town. Interestingly enough, this large building, along with those to the left of it up Cameron Street, were liquor distributors over a century ago. A specialty that likely helped keep shipping costs at bay for Gadsby's Tavern. Also note the three houses to the right of the photo. 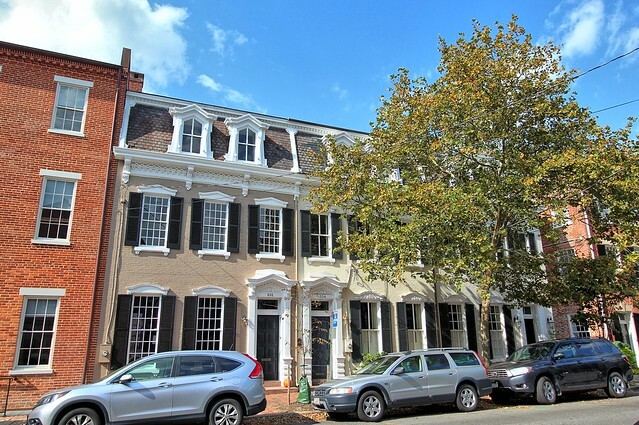 All are nearly identical in overall style and built at the same time in 1840, but each has a different window sash style configuration. 12 over 12, two over two, and nine over nine. Notice just how significantly this single change in style impacts the overall aesthetic of the homes. As we continue to move east on Cameron Street we're going to reach the "center" of town and Alexandria's city hall on the right. While most are familiar with the Market Square side of City Hall, that view is a more recent addition. 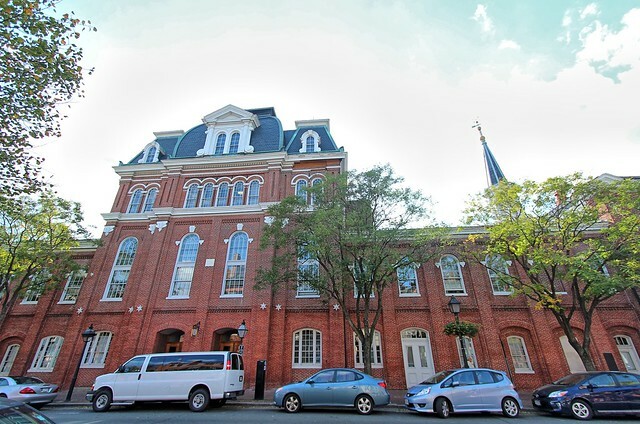 The Cameron Street side is the original view of the rather large building. City Hall was originally built in 1817 and was rebuilt as a replica in 1871 after the original structure was destroyed by fire. This is a bit ironic as the original building housed a court, Masonic lodge, and principal police station, in addition to its role as the primary fire station. The original building is in a U shape covering part of Fairfax and Royal streets and the length of this block of Cameron. If you're on this walking tour during business hours for City Hall, do yourself a favor and walk in through the main doors and into the lobby. There is a photo display of historic photos around Old Town that will give you a glimpse into the city and how it once looked. 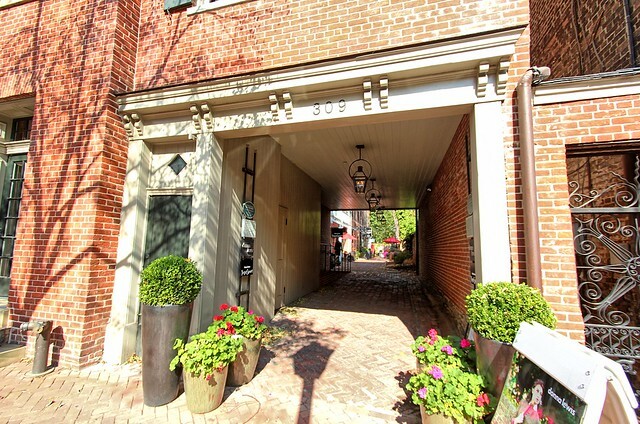 ...to the historic alley courtyard and historic tavern on the east end of the block. There's always something to find that's new and interesting when looking at this string of houses. 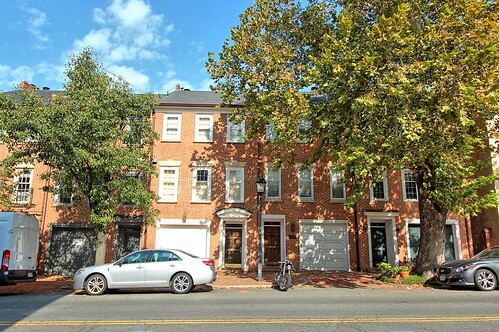 The houses in this block were built anywhere from about 1770 to 1900, so there's certainly a significant mix of architectural styles. One of our absolute favorite elements is the alley that looks like something right out of New Orleans. There's something so welcoming about this carriageway lined with gas lamps. At the end of the alley is a collection of boutique shops. Immediately to the right of the covered alley is the historic Duvall Tavern. Today it's an antique dealer's location and a venue available for small events. It recently underwent a massive exterior effort to remove all of the white paint and restore the original historic masonry. But in a previous life it was another "Washington dined here" location, operating as a tavern. A party and celebration for Washington was held following his resignation/retirement from the Continental Army, so this is truly a place that can lay the Washington claim. If you'd like to see what it looked like when painted white, check out the open housing post we did on the house when it was on the market. 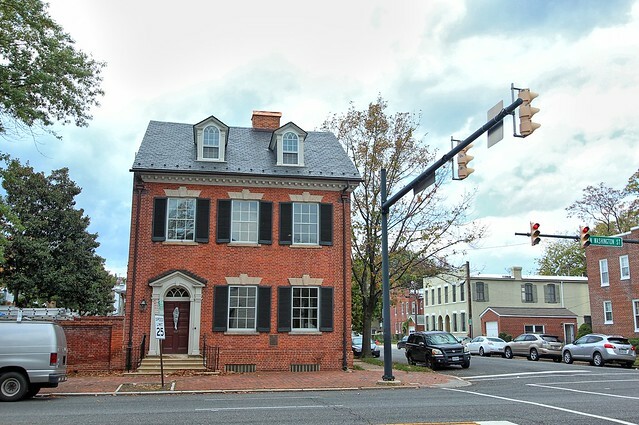 In the next block on the corner of Fairfax and Cameron Street is a building originally known as the Bank of Alexandria. In 1807 it was only the second building in the United States built specifically to be a bank. 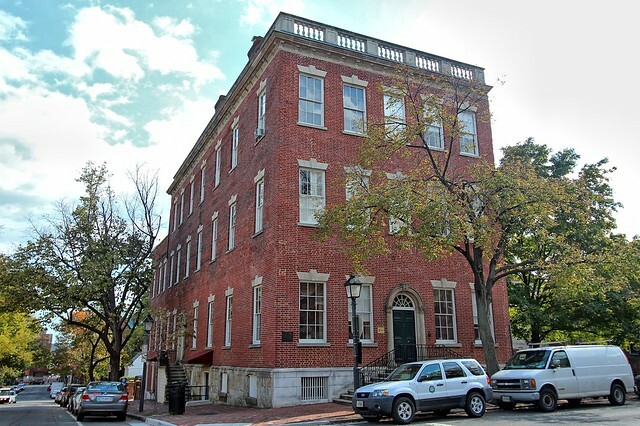 If you're a fan of the PBS drama, Mercy Street, this building is also a remaining portion of the Mansion House Hotel, the building commandeered during the Civil War to act as a Union hospital. Taking a right onto Fairfax Street we'll take a very short detour to take a look at one of Alexandria's most significant historic residences, Carlyle House. This grand home was built from 1751-1753, before a rule was in place that stated homes had to be in line with the street. It was built by John Carlyle, one of Alexandria's original land owners, and was also the mansion where the main character family of Mercy Street lived. 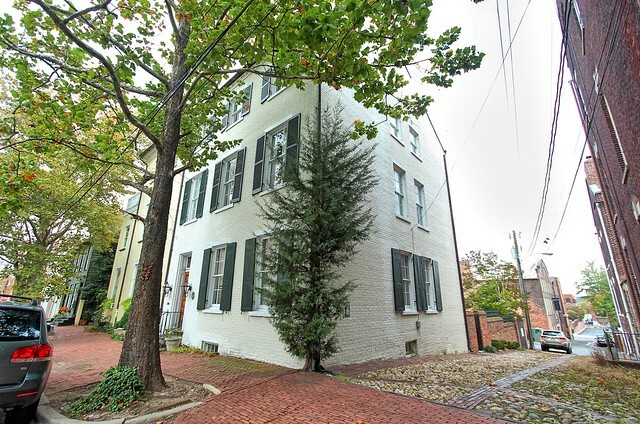 This house is historically significant for so many reasons, which is why it survived over the years where it might have otherwise been torn down. 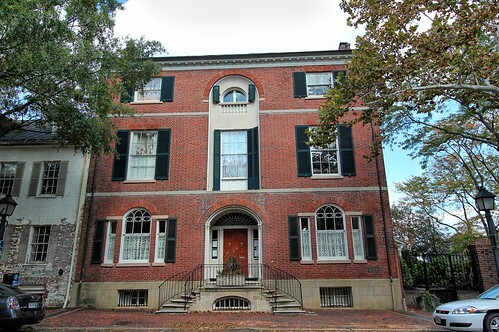 This is another great stop if you're in the mood for a museum house tour. Let's head back to Cameron Street and turn right. Here you'll see some of the very first lots sold to original landowners of Alexandria. As you walk east notice that you're walking downhill a bit. 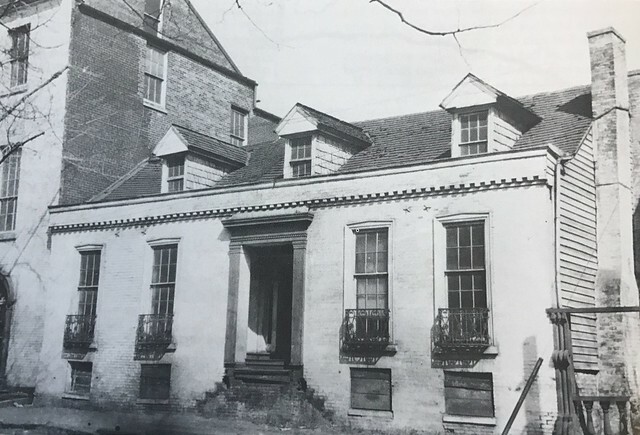 You're heading toward North Lee Street, but this wasn't always Lee Street, since the Lee family was still living in Alexandria at the time it was formed. In fact, this street was previously known as Water Street, primarily because it's where the river used to come up to. The Carlyle House was waterfront property at the time it was built. 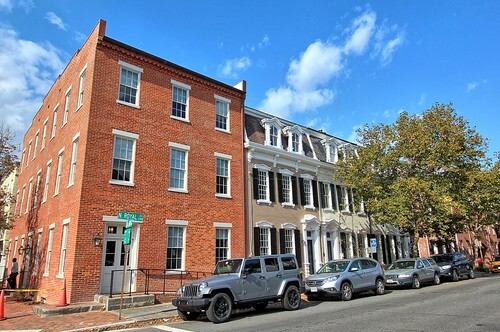 In the years since, infill has extended Alexandria by several blocks, and Water Street was renamed once it was no longer on the water. 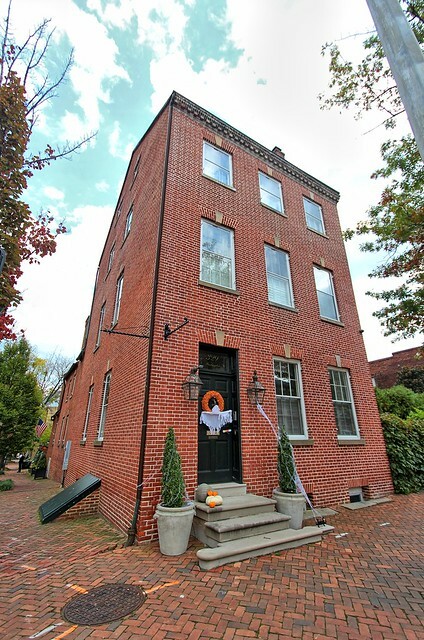 This particular home, with wide lot and side entry, has a Colonial style more like something you might see lining the streets of Philadelphia's Society Hill neighborhood. Continue walking down Cameron Street toward the river. When you reach Union Street cross over toward the pier and head on out toward the river. 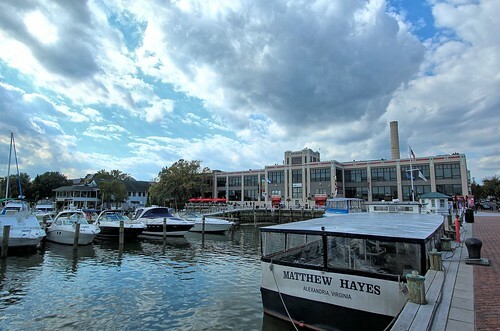 You'll be walking past the Torpedo Factory, which was an actual Torpedo Factory during World War II. Today it's a gallery and collection of artists' studios. When you reach the end of the pier turn left where you'll see the paddleboat named Cherry Blossom, which is a reproduction of a 19th century Victorian riverboat and a fully functional split sternwheeler. 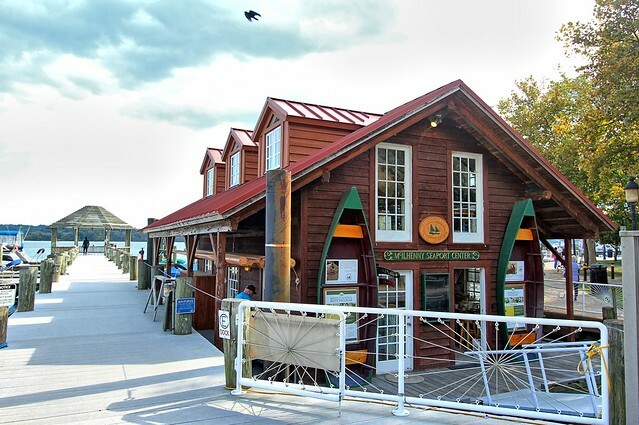 Continue along the pier and you'll come to a small floating building that's actually one of my personal favorites in all of Old Town. You'll be looking at the building of the Alexandria Seaport Foundation. This isn't just any floating building, it's actually a complete wood shop. The Alexandria Seaport Foundation is a non-profit organization that helps at-risk youths between the ages of 17 and 22 to build career, social, and life skills in an effort to help them build their lives as an adult. 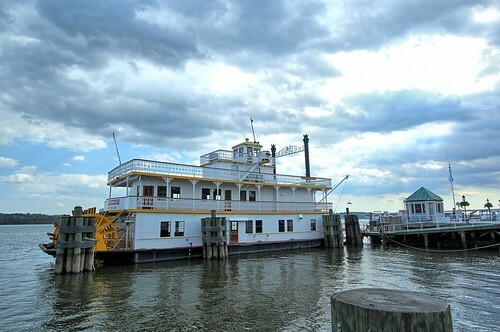 They focus on boat construction in a nod to Alexandria's maritime past, and do it all out of this floating building. 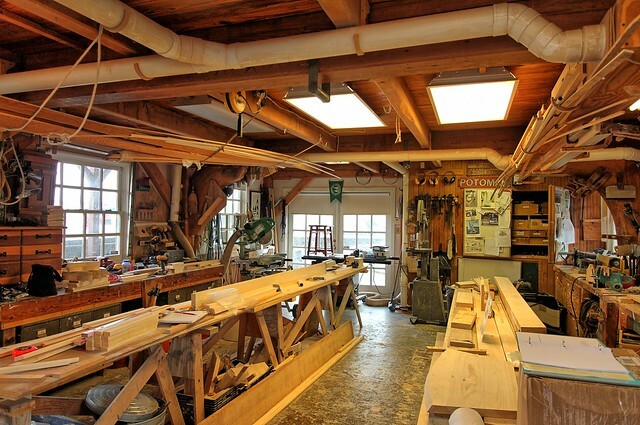 Some of their craftsmanship is usually on display and docked immediately next to the building. 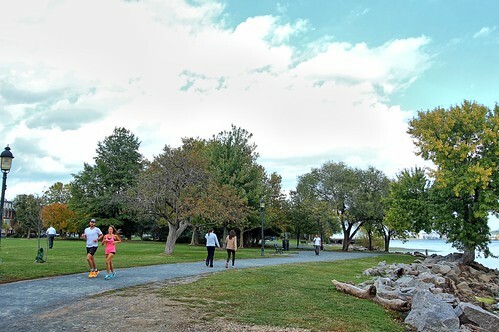 As you continue along this path you'll come to Alexandria's Founder's Park. If you're in the mood for a little stroll around one of Alexandria's beautiful waterfront parks, this is your chance. You'll be sure to see a good number of dogs, people having a relaxing time, and quite a few people enjoying this wonderful space. As you walk this area you'll actually be walking the land that gave Alexandria its start. The original settlement in Alexandria was at the base of Oronoco Street (at the far end of the park) in a tobacco warehouse. The street was actually named for the Orinoco sweet tobacco that was stored in this warehouse on this land before Alexandria was settled, and for the Oronoko Creek that was once nearby. Following the royalty named streets Oronoco should have been the street name "Duchess," but it was skipped in a nod to the city's roots. This street has also been called Tobacco Street. Circle back from Oronoco street heading south along Union Street. When you reach roughly the middle of the park we'll hang a left and start walking toward Quay Street, a small street between Queen and Princess Streets. 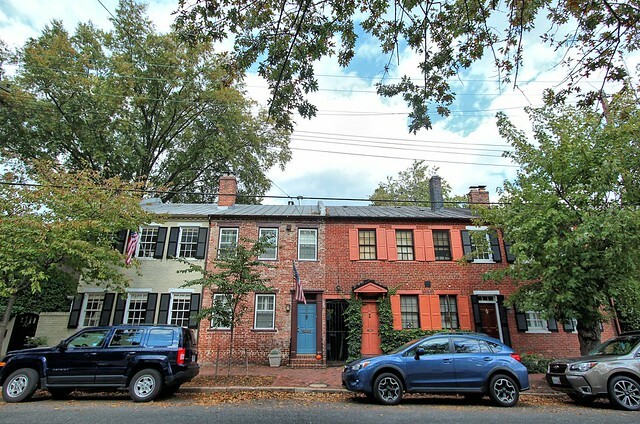 Now, you won't normally find me gushing over 1970's townhouse architecture when I'm otherwise talking about 18th and 19th century historic homes, but this isn't your everyday collection of 1970's houses. 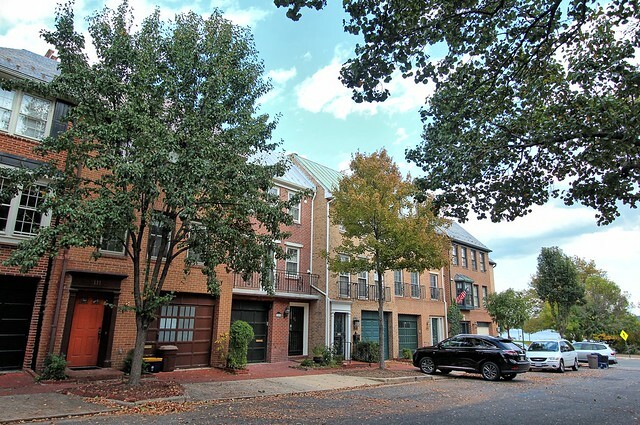 The homes in this block were built in 1971 during the start of Alexandria's urban revival. After years of neglect, many of Old Town's blocks were full of large warehouses that had nearly fallen into disrepair. This block was home to the Alexandria Chemical and Fertilizer Plant by 1912, so there certainly wasn't an amazing collection of homes lost when this block was cleared. By 1970 Old Town had already been designated an historic district, but it wasn't a particularly desirable place to live for many. At the time they knew there was a significant need for new homes to begin luring people back to the once important port town that had fallen on hard times. These homes represent that early effort that ultimately led Old Town to where we are today. It was a major undertaking and one we, and all of Old Town's visitors, are very glad the dedicated visionaries opted to tackle. 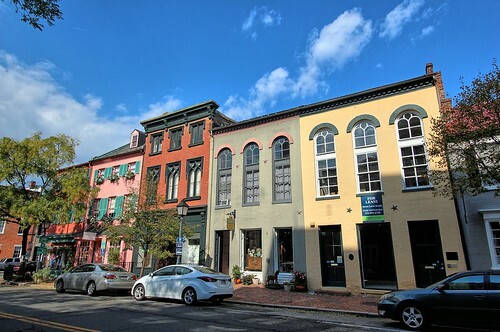 As you reach the corner of Quay Street and North Lee Street turn left, walk about a full block, passing Queen Street, then turn right when you reach Thompson Alley. You'll walk up the cobblestones of Thompson Alley, one of Alexandria's several remaining historic neighborhood allies. Note how the the large houses along this alley seem to have a back portion with separate living area. 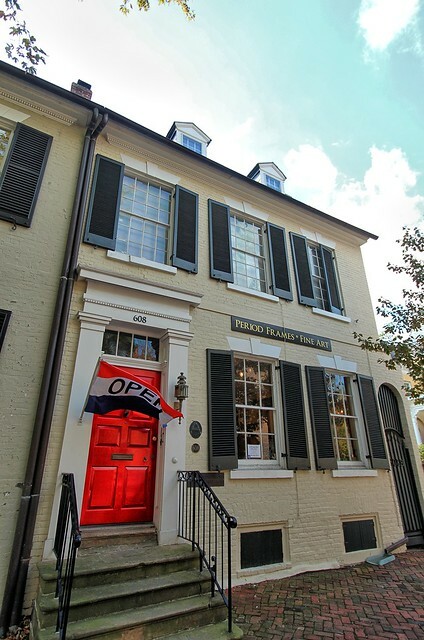 When you reach North Fairfax Street look immediately to the right at the large cream house with green shutters. There's a very interesting feature about this house that's right below your feet. Do you see the basement window on the street side next to the front door? During a renovation several years ago the owners of the house discovered an excavated section under the sidewalk believed to be for ice storage. 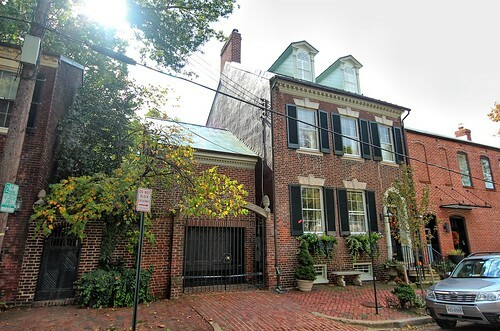 This is now a part of the home and extends nearly to the street. It sat hidden for many years just waiting for an owner to discover it. 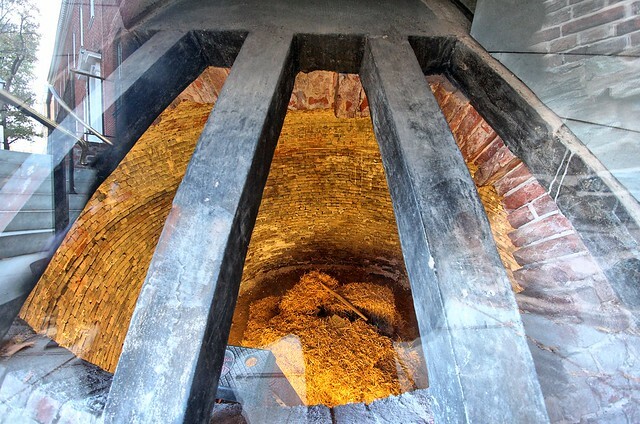 Now it acts as the house's wine cellar. 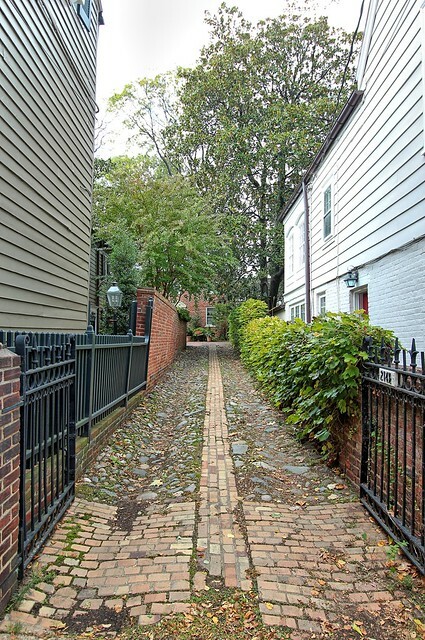 Across the street is another of Alexandria's original cobblestone alleys, and this one likely looks nearly the same today as it did a century or more ago. Turning left and heading south you'll see a collection of beautiful historic homes. One of the houses has a brick facade, an odd bump-out on the second floor, and two dormer windows. At first glance it looks a little out of place and off balance. Looking at the same house from the right side begins to reveal its true identity. What is brick on the front and left is actually clapboard on the right. And if you look closer, you can see that the roof line appears to extend beyond it's natural conclusion on the front of the house. 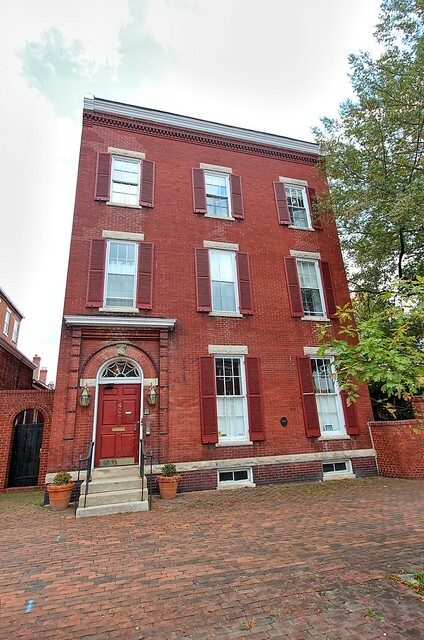 It seems that at some point the front of the house was actually drawn forward several feet and the brick facade changed the entire character of the house. 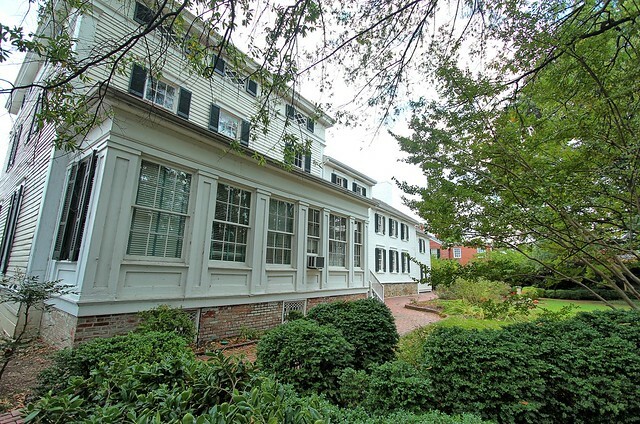 The original house, known as the Dalton House, was built in 1760 and then significantly altered over the years. 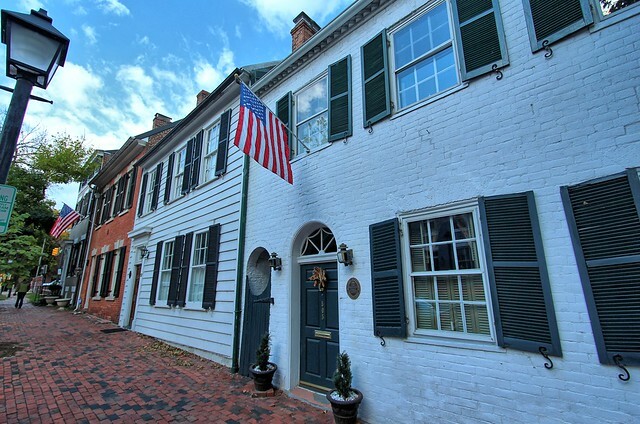 It may be one of the oldest and most significant original homes in Alexandria, and would you believe it, Washington slept here on several occasions. Here's a view of the same house before the left dormer was added to the home. The 19th century brick facade had already been added, but you can get a sense of how dramatically this house has changed over the years. One of my personal favorite houses is across the street from the Dalton House. 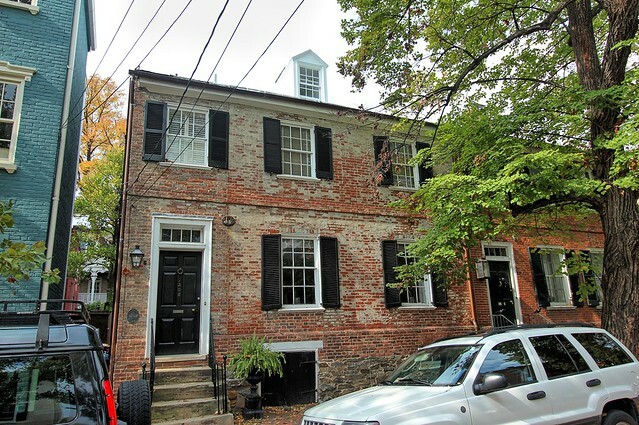 It was built in 1790 and is beautiful on the interior with tons of original details like raised panel walls. If you look closely the photo you can see that the left window and front door appears to have been added onto the house after the fact, taking everything a little out of balance. Let's head back north on Fairfax Street and then hang a left on Queen Street when you reach the corner. 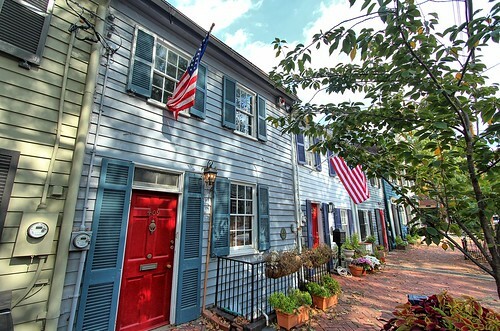 Queen Street is one of Old Towns most quaint streets. Where many historic streets are full of grand historic homes, Queen consists of far more modest homes that are simply full of character. This first row of brick homes sets the stage for so much of the next several blocks. Now, just because I said Queen Street may not be full of grand homes, there are still a handful of pretty breathtaking places. For example, this house at 312 Queen was built in 1800 and looks rather stately in its presentation. As you can likely guess, the garage on the left (and the pool in the back) is a newer addition. 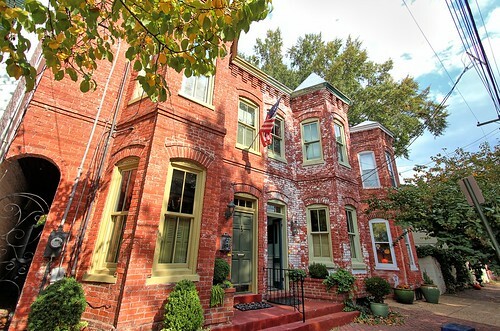 Across the street is a collection of very interesting 1880 Victorian homes. In the following photo you can see the arch of the "horse pass" tunnel on the left house. While they may not have had stables or even horses, this was an architectural holdover in city living from the days where such a feature was a necessity. As we continue up Queen Street just glance around at all of the various eclectic styles in each and every block. The streets grew organically over two centuries, often two or three houses at a time. 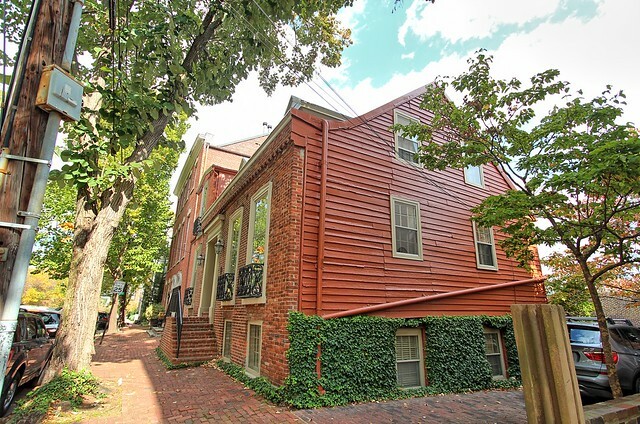 This natural brick home on the corner was once covered in paint, but back in 2011 the owners undertook a massive effort to strip all of the pain and repoint the brick. Today it looks amazing! 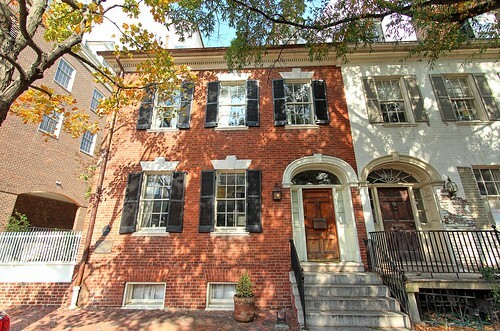 On the opposite side of Queen you'll find a collection of clapboard Colonial homes. This is a good example of what much of Old Town looked like for a significant period of time. Over the years many of these clapboard homes were lost to decay or "progress," replaced by masonry structures of the Victorian era. But these homes on Queen Street survived the years. 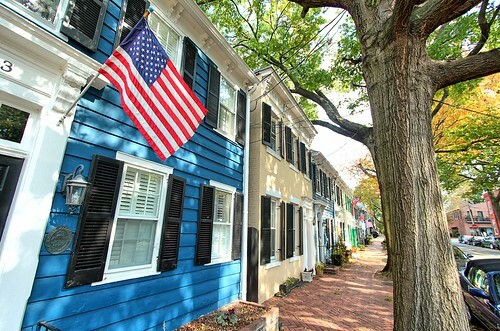 The bright colors, fluttering flags, and mature trees hanging over brick sidewalks capture Old Town's overall feel and appeal so completely. Queen Street also has an incredible mix of architectural styles. Each block is a stunning combination of angles, details, and colors. Every roof line is a little different than the last, and houses seem to have grown organically from one to the next. 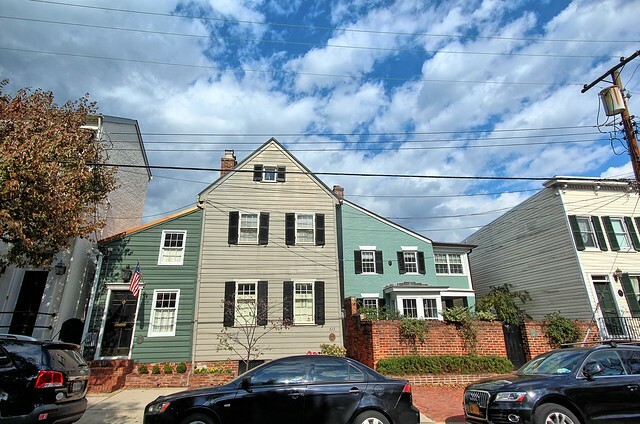 Flounders, gable ends, classic row houses, all coexist as neighbors and partners along Queen Street. And we'd be remiss if we didn't mention Queen Street's biggest attraction...all because of how small it happens to be. Yes, we're talking about that little blue hiccup between the white and red houses, otherwise known as the "Spite House." 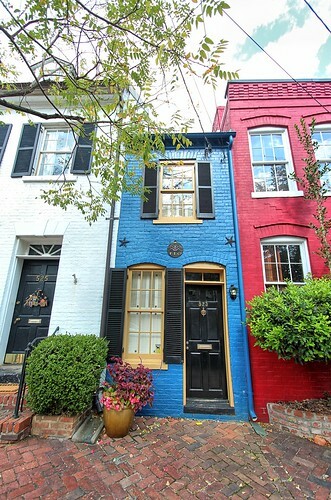 The Spite House has been the subject of many magazine articles, tour guide talks, and even television shows. 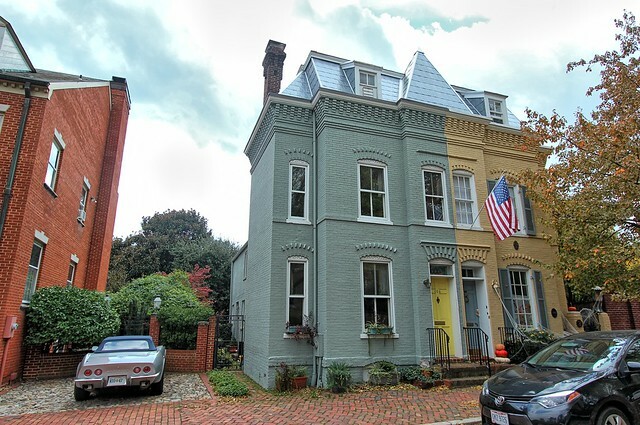 Hey, we even have a blog post that gives several stories as to the origin of the Spite House. If you're having a hard time seeing seeing the tiny home beyond that utility pole, don't worry, we have better angle for you. Just beyond the Spite House turn right onto North St. Asaph Street and begin heading North. 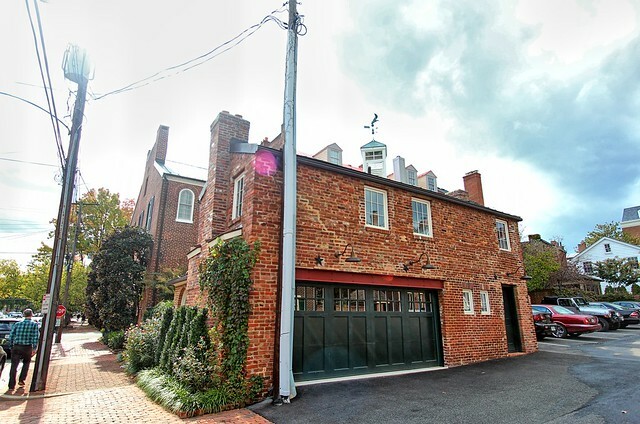 Almost as soon as you're on this street you'll see a wonderful renovation to turn a carriage house into a home. We watched for months as this utilitarian space was transformed into someone's lovely and unexpected home. This is the kind of architecture you'd be hard pressed to fine in many other places in the country. Continue north on St Asaph street several more blocks and you'll run into one of Wendy's favorite houses in Old Town at 402 N. St. Asaph Street. It was built in 1860 and has been lovingly restored and maintained in every way possible. From the gas lamp to the landscaping, the exterior of the house is simply amazing. It was recently on the market, and Wendy tried to convince me it was time for us to move. Across the street from the home above is the large grey house on the right with the large red arched door. This building, which is now a home, once served as Alexandria's jail. When you reach the corner of N. St. Asaph Street and Oronoco turn right and head west. Looking back at the corner you'll see the homes below. The house on the corner is a beautiful example of how many homes in Alexandria were altered from their original styles. 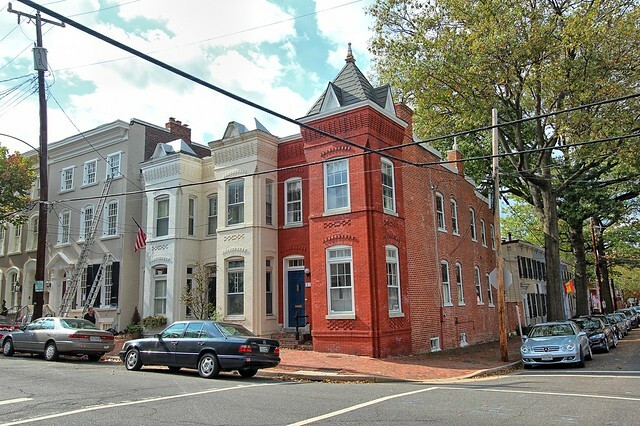 The home's first two floors are decidedly Federal, but the ornate mansard roof with cast iron details and slate roof is a decidedly Victorian addition. The small white house to the right was built at nearly the same time, but its roof was never popped in favor of Victorian styles. 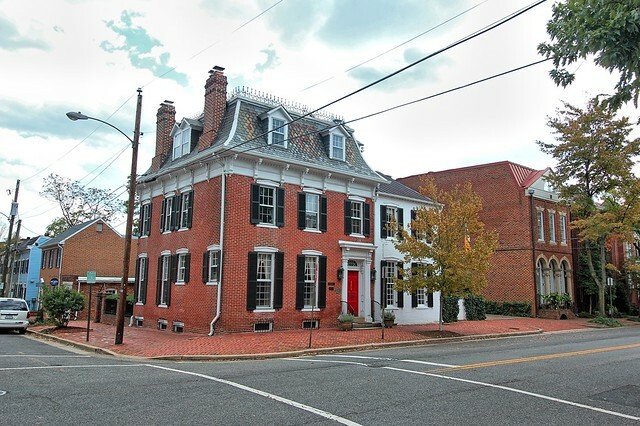 As you begin west on Oronoco Street you'll have a hard time missing the extremely stately twin homes, one of which is the officially recognized and on the National Register of Historic Places, Lee Boyhood Home. We've been inside on a tour and the home's interior retains many of the original details, such as plaster crown moulding and casings. It is beyond impressive. 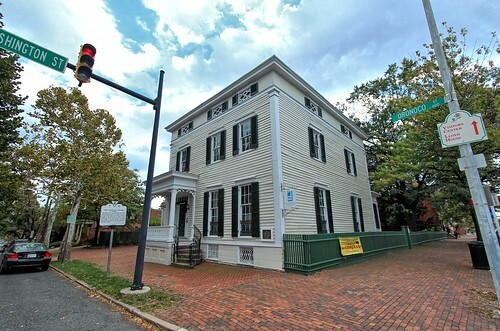 Across the street from the Lee Boyhood Home is the Lee-Fendall House. 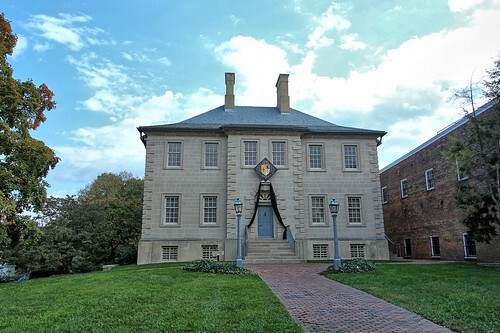 Built in 1785, home to 37 Lee family members, used as a Civil War hospital for the Union, and currently a museum, it is absolutely worth a stop if you have time for a tour. 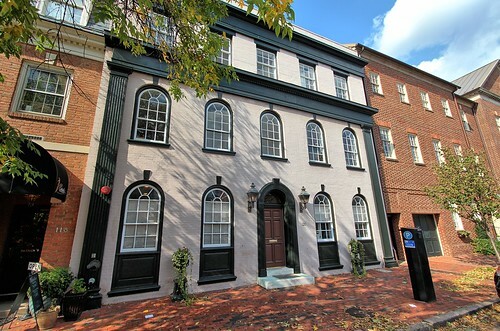 And would you believe it, this was home to Henry "Light Horse Harry" Lee, who gave Washington's famous eulogy. When you reach Washington Street turn left and begin walking toward the back of the house. As stunning as the front of the Lee-Fendall house is, the back is my favorite part. The beautiful grounds and the amazing lines of the home from all of the additions is awe inspiring. Directly across the street (technically in the Northwest Quadrant, but that's okay) is the Edmond Jennings Lee House. 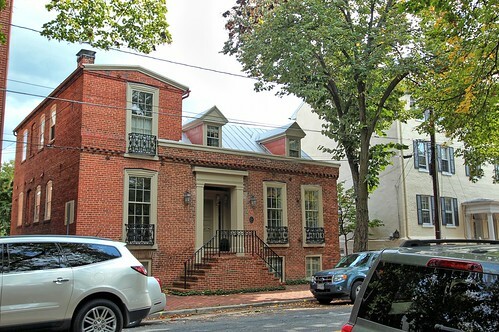 Yes, another Lee house, and an absolutely beautiful home built in 1797 to boot. The Lees bought these lots as they wanted to live on the main street going through town. Today it's a busy intersection, but back when the click clack of horse drawn carriages was the extent of the noise, it was far easier to be more centrally located than to trek through town to where you were trying to go. As we continue south on Washington Street, glance around at some of the beautiful buildings that line this street. This major thoroughfare had some impressive buildings constructed over the years. When you reach the cobblestones of Princess street, check out the large brick home on the corner. 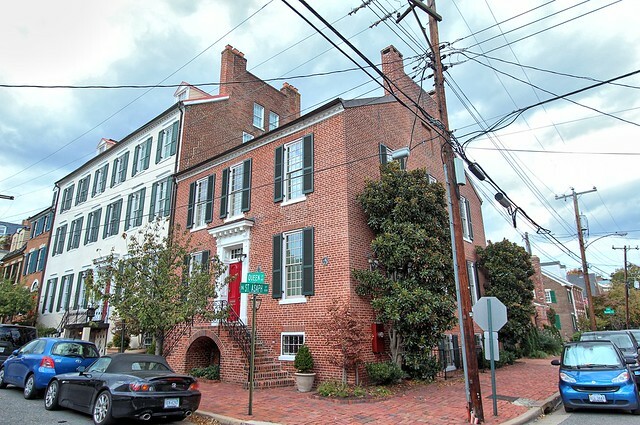 This home has been a private residence for some time, but is currently embroiled in a controversy as a restaurant owner would like to turn it into a restaurant. We'll have to see how this shakes out over the upcoming years. Turn left on Princess street and begin walking east on Princess along Old Town's second of two cobblestone streets. These twin Victorian homes hold a bit of a secret. I'm not positive but I believe the facade is a Victorian addition. These homes were built in 1820, but the front suggests they're more likely from about 1880-1890. When you reach North St. Asaph Street turn right and begin walking east back towards King Street. On the way you'll walk back by Queen street and the house in the photo below. As you pass, take a look at the three level sleeping porch on the back of the house. 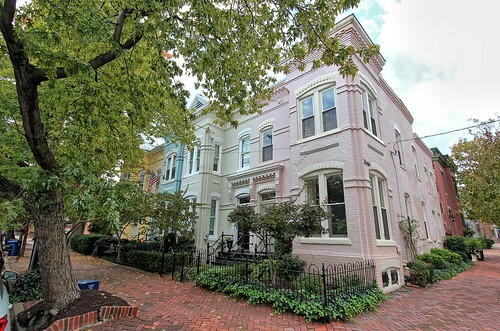 Also take a moment to check out the pastel Victorian ladies on the opposite corner. On the pink house look up at the corner to see one of Old Town's original early 20th century ceramic and metal street markers for Queen Street. When you reach the corner of St. Asaph Street and Cameron Street take a right and begin walking west. Here you'll see this quadrant's grandest home, the impressive Lord Fairfax home. 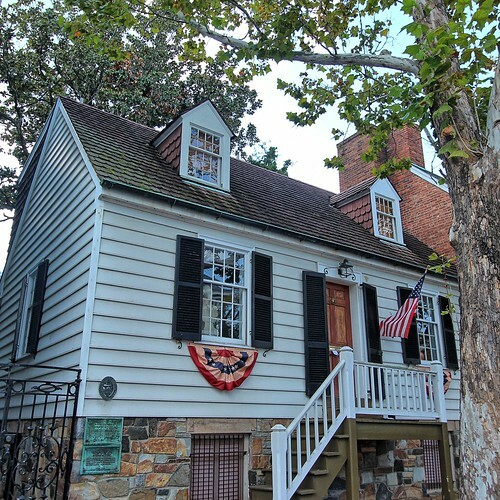 We wrote a blog post about the Lord Fairfax House a few years ago, so if you'd like to see some interior photos and learn more about the home's history, be sure to check it out. Just beyond the Lord Fairfax House is another of Robert E. Lee's childhood homes. This one is far more modest than the massive one on Oronoco, but still none too shabby. It was recently converted from an office back to a private residence and the interior is extremely well intact. 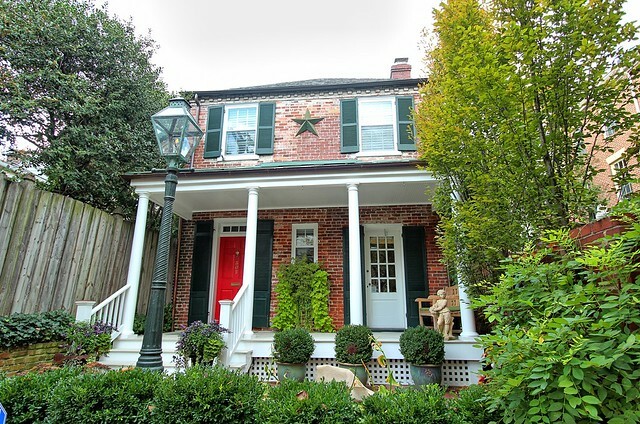 Across the street on Cameron is an example of a home that does double duty as an antique store. This is a relatively new store in the area but is certainly worth a stop. Some of the tall case clocks they have in their shop are simply stunning. 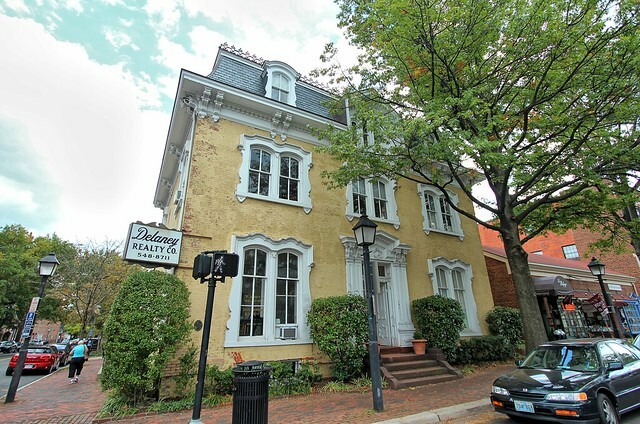 As we reach Washington Street near the conclusion of our tour, look back at the corner for a glimpse at the stunning Delaney Realty Co. home. Today it's a multi unit apartment but this grand Victorian has played many roles in its life. Continue south on Washington Street until you reach King where our Northeast Quadrant walking tour will conclude. As you can see, this quadrant of Old Town is nothing short of spectacular. Dripping with history, full of interesting details, a mix of old and new, and waterfront city parks, it pretty much has it all. We hope you enjoyed this tour and learned something new you didn't previously know about Old Town. And we really hope you'll be able to experience this walking tour in person on your own at some point. Now that we've got two quadrants down, we still have two to go. I can't wait two share the next two simply because they will be so completely different than our first two tours. So what did you think? Are you familiar with this part of town? Do you think we did a good job covering the best parts? And if you're not familiar, are you now itching to take the walking tour yourself? These are excellent tours with such varied interests: history, architecture, shopping, quirks and more. And with many beautiful photos. Thanks!!! These tours are fantastic! I'm even more anxious now to travel to Alexandria and experience the area in person. Do you have any recommendations on the best times of the year to visit? My husband and I have been to Alexandria a few times and love it. This tours are so pretty, makes me want to come back sooner than later. This area looks very familiar. 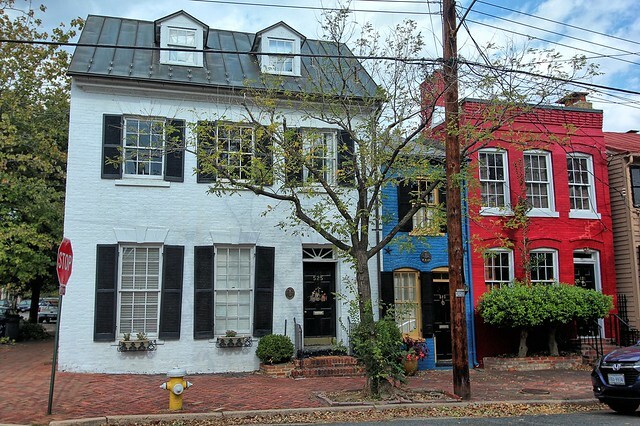 Alexandria is one of our favorite towns ever! Excellent tour and historical information. Thanks! Thanks for the great tour! 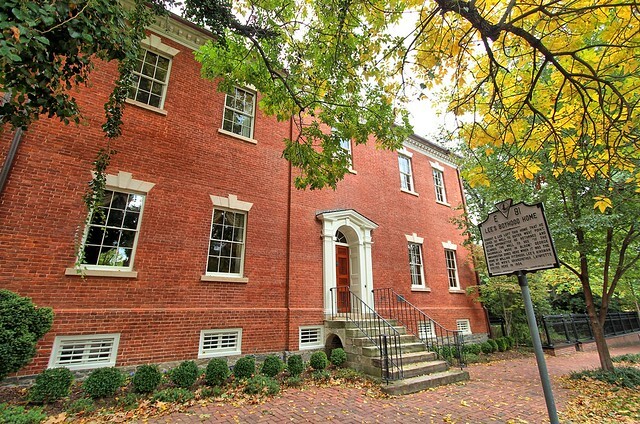 I passed the Dalton house last week and "saw" it for the first time. I would have never known what is was without your post. Looking forward to the next quadrant! Love it. 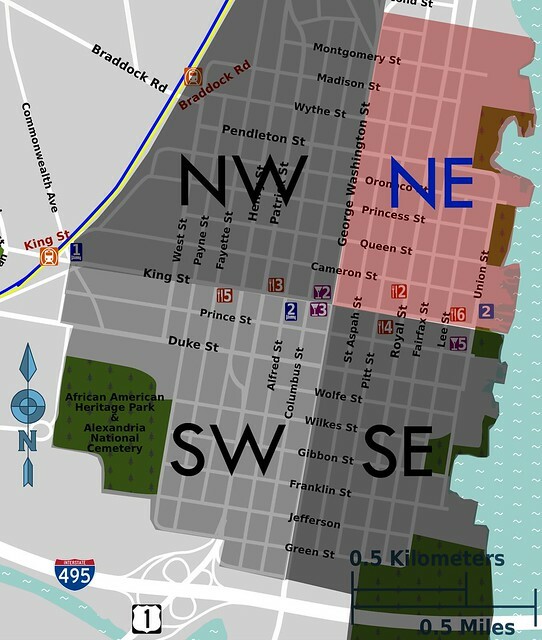 But you should have included Brockett's Row on N. Washington in this section. 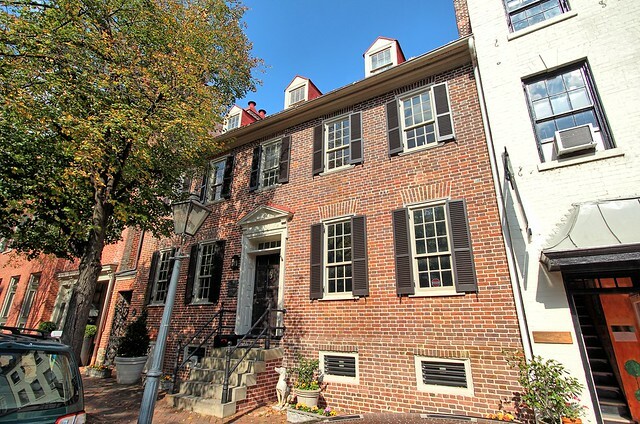 They are some of the oldest homes in the city - all built in 1808! Love this. Excellent tour through old town. Been there a couple of times and love it. I am sad, but understanding, to see the gradual demise of this website. 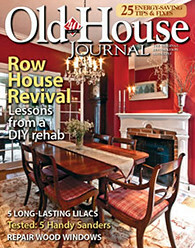 No doubt I'll be reading archives to learn/remember how to do various DIY projects. Thank you for sharing it with us. These are exciting tours. You provide a historical information.